New life and energy is coming to Bega’s Littleton Gardens after shocking vandalism in early May. The community and Council were outraged when over 40 maturing Manchurian Pear trees were cut down over two nights. A damage bill running into the tens of thousands of dollars was a big part of the anger, but so to was the fact that this important green space in the centre of town had been cut down just as it was starting to bloom again. Council’s Recreation and Leisure team soon realised however the opportunity that comes with this situation. A revised replanting design has been developed that reflects the community feedback that followed the vandalism, and idea’s that came from the Council’s Listening Post in the Garden’s in April. Replanting will start in the next week and will incorporate both native and exotic trees. “People told us they were keen to see a greater variety of species in the Gardens, rather than have us replace the butchered trees with more Manchurian Pears,” Council’s Recreation Assets Officer, John Turville said. Native grasses and sedges will also be a part of the planting program, with Tulgeen Disability Services pitching in to help create a new native garden bed outside the library. “It’s fair to say there has been mixed emotions around the Gardens for some time now,” Mr Turville said. “With this new round of works we are keen for the community to see their suggestions and feedback at work and inject a new sense of pride into the space,” Mr Turville said. Some of the new tree species going include, Kurrajong, Water Gum, Claret Ash and Chinese Pistachio. Flower garden beds and planters have also been incorporated into the design. “Council wants people to see the Gardens as theirs, and see it as a place to host local events such as the weekly Farmer’s Markets, community rallies, ceremonies and gatherings,” Mr Turville said. The vandalised trees will be removed as part of the works, with more than half of the trees salvaged and reused. Council will transplant these trees into containers and grow them on in a nursery setting for later reuse in other parkland or roadside plantings. To mark this new round of works, Council will host a tree planting ceremony on Friday August 5. “I am pleased that a number of people with a long rich connection to the Gardens will join us for that occasion and again have their hands in the soil of Littleton Gardens,” Council’s Director Community, Recreation and Leisure, Anthony Basford said. “As a way of moving forward, we are keen to recognise the people and the groups that have helped shape the Gardens over many years,” Mr Basford said. Well known Bega local’s planting a tree on the day include Margaret Sirl, Ralph Hetherington, Beth Worthy, Phil McDonald and Marshall Campbell. The tree planting will be part of the Shire’s National Tree Day celebrations and coincides with the Bega Farmers Market. 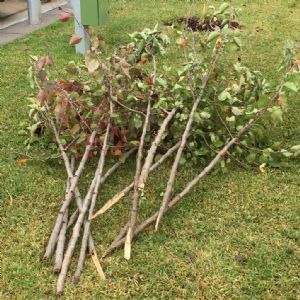 Council will be giving away indigenous trees and shrubs funded from tree removal application fees. Three per person are available backed with advice from expert staff on how to care for them. Any queries should be directed to Council’s Leisure and Recreation Officer, John Turville, on 0427 570 599. Photograph: Trees struck down by vandals in early May.